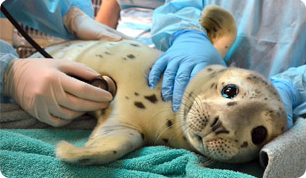 The Marine Mammal Center's San Luis Obispo Operations (SLO) rescues animals along the southernmost part of our rescue range. Approximately sixty volunteers service San Luis Obispo County and Santa Barbara County to Point Sal. San Luis Obispo Operations began in 1993 with volunteers recruited from Pacific Wildlife Care, a group involved in rehabilitating sea birds and land mammals. Prior to that time, volunteers were driving up to five hours one way from Sausalito to rescue animals. Sometimes they would arrive to find that the animals were long gone. Since 1993, San Luis Obispo Operations volunteers have been operating out of private homes and garages. A daily team leader receives calls dispatched from The Center's 24-hour hotline and, in turn, contacts local volunteers to coordinate a rescue. Trained volunteers administer food and medication and, once stabilized, the animal begins its journey north. In January 2006, our San Luis Obispo volunteers moved into the brand new rescue and triage center in Morro Bay. Duke Energy, our hosts for our Monterey Bay Operations, recognized the importance of our work and donated additional property for our Morro Bay operations. The property is shared with Pacific Wildlife Care who is constructing a facility for oiled birds. Volunteers are always needed for animal assessment, rescue, triage, transport, and equipment/vehicle maintenance. Volunteers also assist with public outreach and education programs. Training is provided. A minimum commitment of four hours per month, on an "on-call" basis is required. Prospective volunteers should be aware that rescues for SLO are seasonal, and there may be periods of inactivity.